Hannes and Holger met behind the decks in spring 2008 at one of those open-air parties Which start as a gathering of friends and overflow in a park-euphoric rave of thousand people. 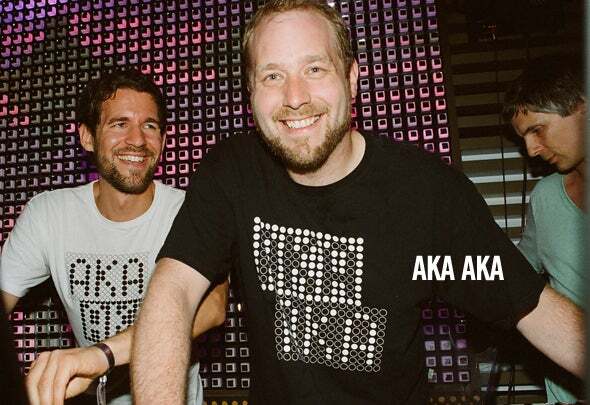 Since then concentrate their energies Hannes & Holger on their collaboration: AKA AKA. Under contract with Oliver Koletzki's label Stil vor Talent, March 2009 saw their debut 'birds EP' released and supported by artists like Dubfire, Claude VonStroke and Troy Pierce. Their track 'Woody Woodpecker' stayed for one month on the Beatport minimal charts at one place and then the vinyl version hopped from 0 to 1 by release day on decks.de. In May 2010 it was awarded the 3rd place with the annual of the Beatport Music Awards in the category 'best track minimum'. So their 2nd and 3rd release on Stil vor Talent being played by Luciano, Adam Byer, Sharam (Deep Dish), Gus Gus and many more became a huge success. In October 2009 they started their own label Burlesque Musique Which Focuses on on non-conform and minimally influenced by techhouse swing, jazz, balkan, funk and other funny but danceable music. Besides Burlesque Musique they run the already established since 2005 and party music label Pentagonik. Known for their live act and driving djset the two play in most of Berlin's clubs like Arena Club, Watergate, Mary, vault or knight Butzke. Travelling around Europe they visited clubs in Zurich, Madrid, Moscow, Turin, Vienna, Cologne, Hamburg, Munich, etc. In March 2010 they played their first live performance at their Watergate featuring trumpeter Thalstroem who plays the trumpet and the Electronic Wind Instrument Which adds a new floating layer to their music. Together with AKA AKA Thalstroem produced their debut album was released on the 30th Which of May 2011 on Burlesque Musique. It stayed on # 1 of the Amazon sales charts for weeks and techno was voted one of the top10 albums of 2011 by the readers of Germany's Groove magazine and Partysan. They also received the "best live act 2011" award at the Partysan Poll.